In so many ways, this is exactly the direction I think the Church needs to go. We must recognize that the culture we are part of is no longer a “joining” culture so we must become a “sending” Church – one that equips our people to go out and preach the gospel in every way possible. Our very lives must become the chief means by which others will see and know the transformational power of the Spirit as we are drawn more deeply into the pattern, form, and essence of Christ’s own life. One issue that continues to niggle at me though is the anti-church and anti-clerical tone that many presentations of this message come wrapped in. In the rush to create a missional Church we seem to be running past the very essential question of what it means to be Church at all. When I was going through the ordination process, I was asked what I thought of the Social Gospel – that is the preaching of a Gospel message that focused on the issues of inequality, racial justice, poverty, and the like. I simply answered that I rejected the notion of a “Social Gospel.” I did not say I rejected the essential nature of the Gospel’s answers to these pressing questions but I rejected the notion that somehow there was a particular form of preaching the Gospel that by its particular virtue elevated it over some other, less social, form of the Gospel. The entirety of the Gospel is social – its wholeness answers the deepest needs of society. If one is preaching the Gospel then one is necessarily preaching justice and reconciliation. This is a bit of my issue with “Missional Church.” If one is truly blessed to be in a place that is living into its fullest identity as a Church then “missional” becomes a redundancy. The chief vocation of the Church is to worship God. Our chief act of worship is the intertwining of our life with Christ’s such that his mission becomes ours. The Church’s role is missional insofar as we are being caught up in the love and life of Christ. More important than what God is calling us to do is who God is calling us to be as a people formed in the image of Christ. This is where I think the Missional Church movement and the traditional role of the Church might just intersect. At its heart, the missional church is one that forms people to be living witnesses in the world around them. The traditional role of the Church is to give people the basic tools and framework for that kind of transformation to take place. We form people, at our best, to work, pray, and give for the spread of the Kingdom of God. This work is not done in spite of the Church but through the Church. We offer people the fundamental means by which they can know their lives as bound by water and blood and empty tomb to the wholeness of Christ’s. Worship, for the Church, is not a means to an end – it is the summit of the Christian life. It is the place in which brokenness and healing come together. It is the place in which longing and memory commingle. It is the place in which the holy takes common form and bread becomes Life. It is the place where first fruits and last things are known. It is the place where forgiveness is found and forever held in shaking palms. A Church that offers lovingly and longingly the Presence of Christ is one that will become a missional Church because worship will be not simply a moment or an instant but our very breath. That breath will take us out into the world as a people refreshed and reinvigorated for the rigors of daily witness. We must be a missional Church – and we must simply be the Church. Sometimes we like to make things harder than they need to be. We look for the new thing that will draw attention or make us more relevant. Yet what the culture is longing for, aching for, is a place that is real – that is authentic. Nothing can be more authentic for the Church than to be a place that lives its worship and loves with fearless joy. In worship we offer our whole and broken selves to God – we make of our totality a living sacrifice that we pray might be holy and acceptable. The work of redemption is the restoration of our relationship with God and with the world around us. In true and lively worship, we allow ourselves to be opened to the work of the Spirit such that our lives become things of holy, healed brokenness. 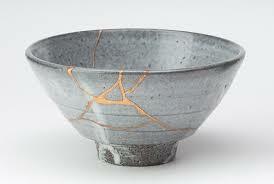 Kintsugi is the art of fusing together the broken pieces of pottery with gold seams such that the newly repaired piece of pottery is deemed even more beautiful for having been broken. In worship and prayer, we ask God to take the broken places in our lives and fill them – to make us able to serve even as we are signs of God’s healing love. We become a sign to the world that God uses the broken – even a broken Church – to show forth the beauty of his restoring power. Our churches, at their best, can be places of action-reflection in which we live out our faith and find within the community the place to refine and deepen our articulation of how Christ is moving in our lives – in spite of and because of our authentic lived experience as a Body. The Church has existed before Christ walked the Earth. It is the Body of God’s beloved, known and called by him before the first sunrise. We do ourselves a disservice if we pretend that to truly be people on a mission that we have to leave the Church behind somehow. We can’t leave it behind – we can only seek to live into its deepest wholeness more fully. It needs love, care, and even reform but its essence, which is His Body, will hold fast. There are many more ways for us to live into the wholeness of our missionary vocation as the Church – there are just some quick thoughts and I look forward to hearing the many more that so many have to offer. As always, thank you for sharing your thoughts.